At a yard sale recently I picked up a big Power Rangers semi tractor trailer and 5 action figures. Pierce has never seen the show, but the price was right and I thought he'd have fun with it. He certainly has enjoyed it, so when I saw Power Rangers pasta in the store I thought I'd pick it up. Some years ago Paul asked me not to cook whole grain pasta ever again. I have obliged. But he was out of town on business. What he doesn't know won't hurt him, right? The boys had homemade bread with butter, cut in a ninja shape (cool cookie cutter, huh? 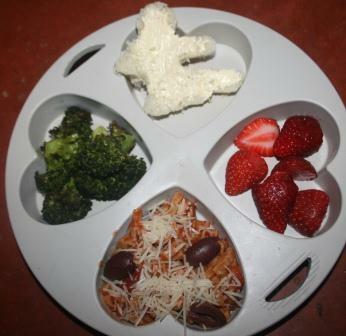 ), fresh strawberries, roasted broccoli, and Power Rangers pasta with parmesan and kalamata olives. All 3 boys ate every last bite and earned themselves dessert! 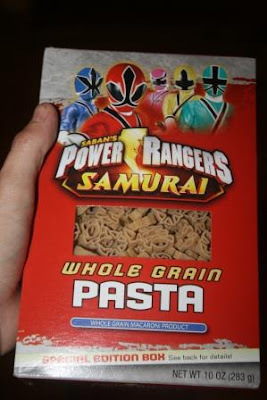 I thought the Power Rangers pasta tasted great for being whole grain. I'm betting Paul wouldn't even notice if I cooked it again. Although he might notice the funny Power Rangers shapes! For more fun lunch ideas, check out Muffin Tin Mom. They've improved whole grain pasta sooooo much in the last few years. He might like it now! We like whole grain pasta here. I hope you can get Paul to like it. This Monday's lunch looks wonderful! How Fun! When my son was a wee one - he LOVED the Power Rangers!! We love whole grain pasta! I vote for seeing if Paul notices. How much fun is your plate! We are huge whole grain pasta fans here! The taste of whole grain pasta has improved by leaps and bounds in the last several years. And some brands are better than others! Another imaginative, delicious looking meal! How neat that the "fun" pasta was whole grain! I put whole grain pasta in a regular box of pasta. Hubby saw the box and couldn't tell the difference. I think the smaller diameter the whole wheat pasta the better, the thick stuff gets a little tough it seems. What a great feeling to see an empty plate and healthy smiles all around. Pasta power to the rescue! Well, I am with Paul on the whole grain pasta idea. Maybe it is time I tried it again also? My husband doesn't like whole grain pasta either. What's wrong with our men? HA HA I've never watched the Power Rangers myself. I bet my boys would like it. Can I have some pleae? Thank you for your concern of me. I am fine- but mommy is not well right now. I enjoy ww pasta, but my husband and kids don't. Maybe I should try some fun shapes! Thanks for the tip. Your muffin food looks so yummy! Fun lunch, and great yard sale finds too!! How fun! That sounds like a good dinner; one I'd even love to eat! Like others, I think the taste has improved over the last few years. Good for the boys!!!! We don't eat much pasta since the kids have grown and left. I bet they would have gotten a kick out of Power Rangers pasta. All four of my kids were into the Power Rangers. I even painted life size power rangers on their play room wall. I wished later on I would have taken a picture of the painting before we painted over them. Oh well live and learn. I don't eat pasta at all, now my Hubs is a different story. He is Italian so if there is no pasta in the house, there is nothing to eat. Whole grain..!!! not sure he would be willing to try that. My kids have vetoed the "brown spaghetti" as they have called it. Now I buy the protein fortified stuff. Manhn! I wish I was your kid getting those fun lunches! Believe it when I say my dear Mommy never made lunch or breakfast, unless we had house (overnight) guests. But she always made dinner. Always dinner always had potatoes!!! Do I eat potatoes now you ask? Only in for form of Lay's Potato Chips at a BBQ or Subway - hahahaha. Have a great day/evening. Ninja stuff is always a winner with the little guys, I find. I actually don't mind whole grain pasta, but don't cook it as much as I should. My son loved the Power Rangers! We switched to whole grain pasta a year ago, and now can't tell the diff. It does take some adjustment, but we really like it now. The power rangers are adorable! I like your muffin tin lunches. I just wrote a post w/ pics...30 lunches for 30 days. I got tired of making the same things! So I got creative! I made the switch to whole grain pasta and my family didn't even notice the difference. Although I have to say that mine doesn't come in cool shapes like that!